Over the years I’ve heard time and time again low blood sugar episodes being compared to inebriation. And, maybe because I’m not on the outside looking in, but rather the person in the moment, I’ve never related to that comparison. Sure, there are a lot of similarities – irrationality, unpredictability, blurred vision, slurred speech, passing out – but drunkeness, at least in the moment, is often viewed as fun, exciting, thrilling. Whereas hypoglycemia, for me, is more akin to full body failure. It can last anywhere from 15 minutes to several hours. My brain in a fog, my eyes desperately trying to catch the words maniacally dancing on the page. A part of me deep inside watches from the sidelines, desperately crying out for help. But the words don’t come out. What does is nothing more than a mumble, or a hate-filled cranky mess. I’ve burst into tears, I’ve thrown things, I’ve said things no one should ever say to the people they love – all because the one word I need, that’s right there in my brain, I can’t verbally grasp. I want to put my head down. I want to shut my eyes. I want to sleep. I can’t. I need sugar, fast acting sugar, I take a swig of orange juice. I should wait, at least 15 minutes, but my body screams for more. I open the fridge, the cupboards, my desk drawer, my wallet and fill my mouth full of cookies, chocolate chips, peanut butter, crackers… More. More. More. I’m sick. I want to puke. My body can’t handle the sugar overload. As my blood sugars take a turn upwards, the headache ensues. The raging headache, so fierce I can’t move my head, I can’t open my eyes, I can’t think. Make it stop. Please. Make it stop. I’m at home. I’m at work. I’m at the playground with my son. I’m on a run. I’m in my car. I’m shopping. I’m taking a test. There is no stop watch. There is no vacation time. There isn’t even a lunch break. * This post was part of a collaboration between a few of us T-1 bloggers to show the story of diabetes beyond the finger pricks and needle jabs. The above is just one part of my disease. This entry was posted in Diabetes, Uncategorized and tagged how diabetes feels, hypoglycemia, living with diabetes, low blood sugar, Type 1 diabetes. Bookmark the permalink. Awesome description, I have never heard a detailed account like that. 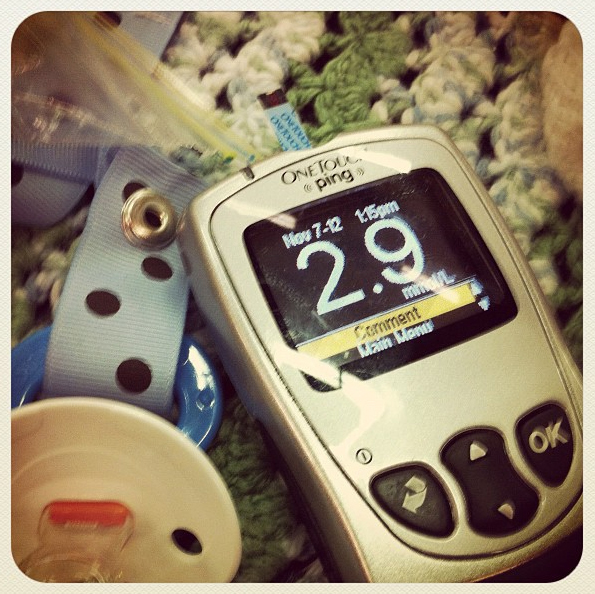 I am always curious about how my son has and will feel when his sugars get out of whack. At only 2 years old he can’t tell me, your post has given me a little more insight to help understand and help him. Thank you. Oh wow. Thanks for sharing that. To this day, 26 years post diagnosis, my moms is hands down my diabetes hero, and I’m betting you’ll be that for your son for many, many years to come. You guys (parents of T-1 diabetics) are pretty freaking awesome – so thank you! holy snap dude this is SO AWESOMELY poignant and beautiful. I’ve never seen it as being drunk also. Our bodies are DYING, they’re shutting down, that’s scary.